Download the latest C++ Redistributable Visual Studio 2017: (direct link to download the 64-bit version, a direct link to the download of the 32-bit version). Run and install the vc_redist.x64.exe and vcredist_x64.exe files, we will not return to them. On the drive C create a directory Server; inside it create the bin directory (we will install Apache, PHP, and MySQL there) and data directory (our websites and databases will be located there). After unpacking, go to the c:\Server\bin\Apache24\conf\ folder and open the httpd.conf file with any text editor. Save and close the file. Apache configuration is complete! 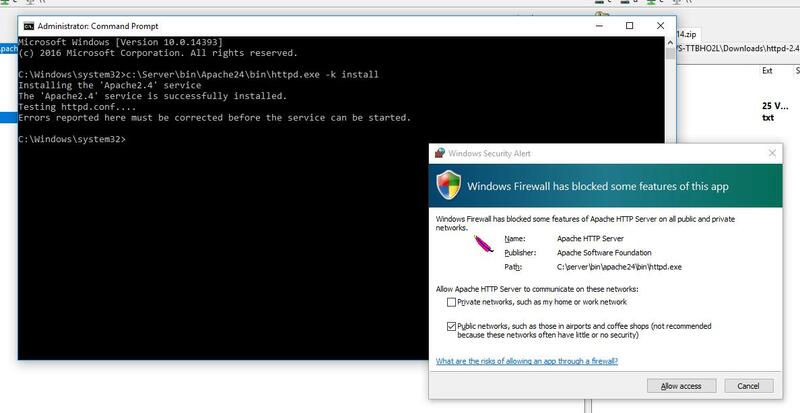 If you see Firewall prompt, select ‘Allow access’. You can play with your new shiny web-server: add html-files to the folder, your server is running. In the c:\Server\bin\ folder unpack MySQL archive (the mysql-8.0.11-winx64.zip file). Rename it to mysql-8.0 (just for short). From now MySQL service will start automatically with every Windows boot. [ERROR] InnoDB: File .\ib_logfile101: 'aio write' return OS error 187. If the problem persists please provide the content of the C:\Server\data\DB\data\*.err file. 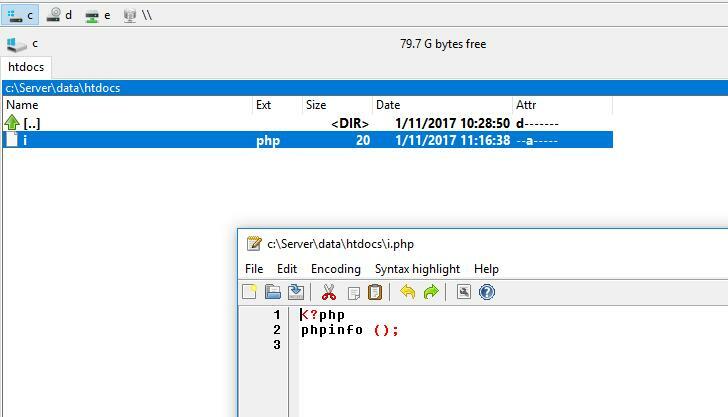 In the c:\Server\bin\ create new PHP folder and copy there the contents of php-7.1.1RC1-Win32-VC14-x64.zip. To the c:\Server\data\htdocs\ folder copy the content of phpMyAdmin-4.6.5.2-all-languages.zip. Rename phpMyAdmin-4.6.5.2-all-languages to phpmyadmin (for brevity). In the c:\Server\data\htdocs\ folder put your local web sites, create HTML, PHP and another files. For instance, I created c:\Server\data\htdocs\test\ajax.php file, so this file will be available at the address http://localhost/test/ajax.php and so on. To create full backup including all web sites and databases, just copy data folder in a save place. If you will need restore your information, with backup you can do it easily. Before updating web-server modules, backup bin folder, if you will have issues you can fallback to previous versions. Make backup of the following files, with them you can deploy new instance of the server faster. 'Create a database named 'phpmyadmin' and setup the phpMyAdmin configuration storage there'. It means you fixed the problem. sendmail_path = "C:\Server\bin\PHP\php.exe C:\Server\bin\Sendmail\sendmail.php --dir C:\Server\bin\Sendmail\emails"
[Sat Jan 14 07:09:55.864736 2017] [mpm_winnt:notice] [pid 2196:tid 584] AH00354: Child: Starting 64 worker threads. To avoid that, add PHP folder to System PATH. 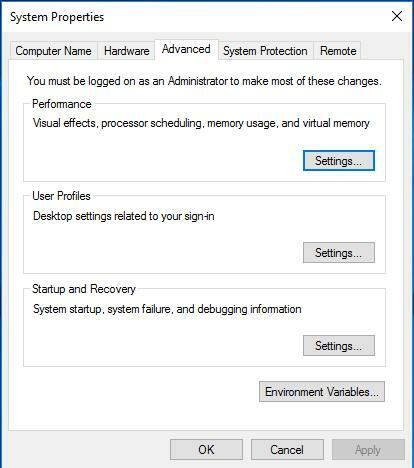 Push the Start (‘Win’) button, start typing ‘Edit the system environment variables’ and open the setting window. Save changes and close all windows. Restart the server. If you do not know what cURL is, then you do not need it. So feel free to skip this step. 1) Be sure to add the PHP directory to PATH (system environment variables). How to do this said just above: https://miloserdov.org/?p=55#12. 2) In the C:\Server\bin\PHP\php.ini file the extension=curl line should be uncommented. 3) Download the https://curl.haxx.se/ca/cacert.pem file, then in the C:\Server\ folder create a new folder named certs and move the downloaded file to this new folder (C:\Server\certs\). When you have hangs, slow traffic and/or when having in your log entries like Asynchronous AcceptEx failed. [Thu Jun 05 07:24:55.957978 2014] [mpm_winnt:notice] [pid 4952:tid 388] AH00354: Child: Starting 64 worker threads. [Thu Jun 05 07:26:16.695036 2014] [mpm_winnt:warn] [pid 4952:tid 1112] (OS 64)Указанное сетевое имя более недоступно. : AH00341: winnt_accept: Asynchronous AcceptEx failed. [Thu Jun 05 07:26:48.250710 2014] [mpm_winnt:warn] [pid 4952:tid 1112] (OS 64)Указанное сетевое имя более недоступно. : AH00341: winnt_accept: Asynchronous AcceptEx failed. [Thu Jun 05 07:29:27.137784 2014] [mpm_winnt:warn] [pid 4952:tid 1112] (OS 64)Указанное сетевое имя более недоступно. : AH00341: winnt_accept: Asynchronous AcceptEx failed. If you no longer need a web-server installed with this guide, follow the steps below to uninstall it. Attention: all the web-sites and their databases created on your local web-server will be deleted! Thanks for this excellent guide. Saved me a lot of time! Thanks so much! I finally have my own PHP7 by following your detailed and clear instructions! This was excellent… Each step was clear and up to date. The enabling of sendmail was/is awesome. Thanks. Great guide. 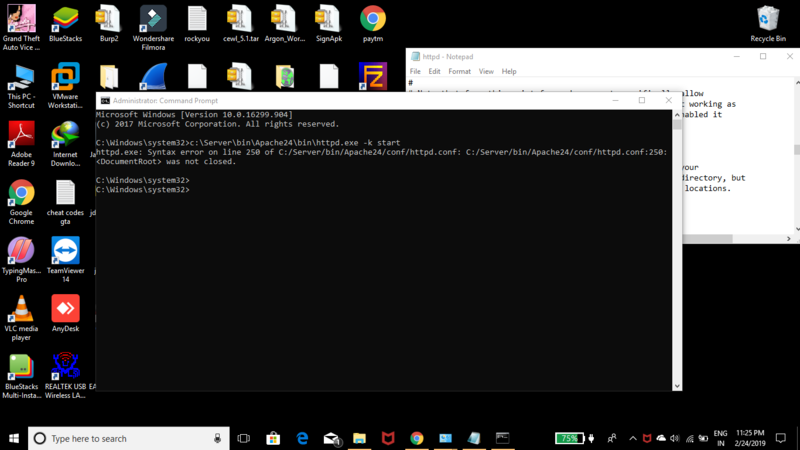 However I ran into an issue in running mysqld the fix though is to download and install Microsoft Visual C 2013 (version 12) or try running mysqld.exe manually and you will see the exact DLL that is missing and just Google it. More likely it is just also a missing installation of Visual C.
Thanks a lot! I’ve fixed the issue. Did you download PHP 7.2? Because PHP 7.1 configuration differs a little bit. Did you uncomment lines as shown on Step 6? Did you restart Apache after that? And i finally got where the problem is : extension_dir = "C:/Apache2/modules/php/ext"
The above extension directory is commented out by default in php.ini file, so all i did was to uncomment it. So, the problem got solved. Just a quick note thanking you for an EXCEPTIONAL tutorial, Sir. You should make a YouTube video with this content as there is nothing up to date there. I'm sure you'll help a lot of people who go to YouTube first like I did. So disapointed, I turned to google and there you were at the top. Thanks again. Hi Alex, thanks for the guide. by the way I found error when I try to copy paste c:\Server\bin\Apache24\bin\httpd.exe -k install. The warning said "the program can't start because api-ms-win-crt-runtime-l1-1-0.dll is missing from your computer. Try reinstalling the program to fix problem". What should I do? 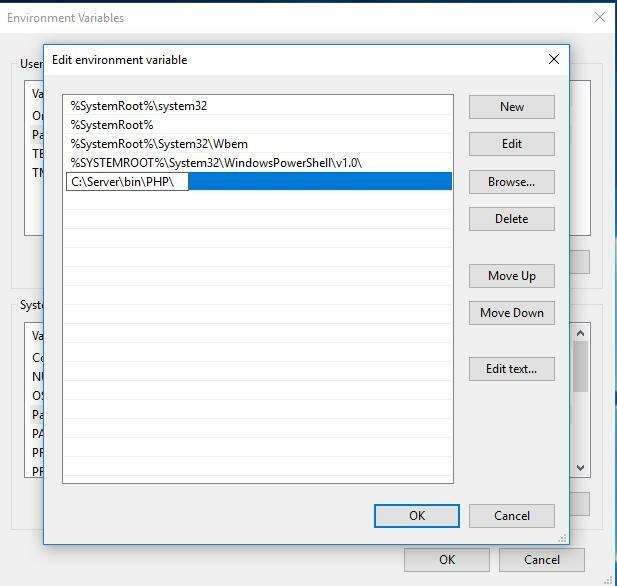 Hello, did you install Visual C++ Redistributable Packages for Visual Studio 2017 and Visual C++ Redistributable Packages for Visual Studio 2013? The missing file is present in ‘Update for Universal C Runtime in Windows’, you can download it here: https://support.microsoft.com/en-us/help/2999226/update-for-universal-c-runtime-in-windows, but it is not necessary to install for my manual. Yes I did. I have installed all of them. 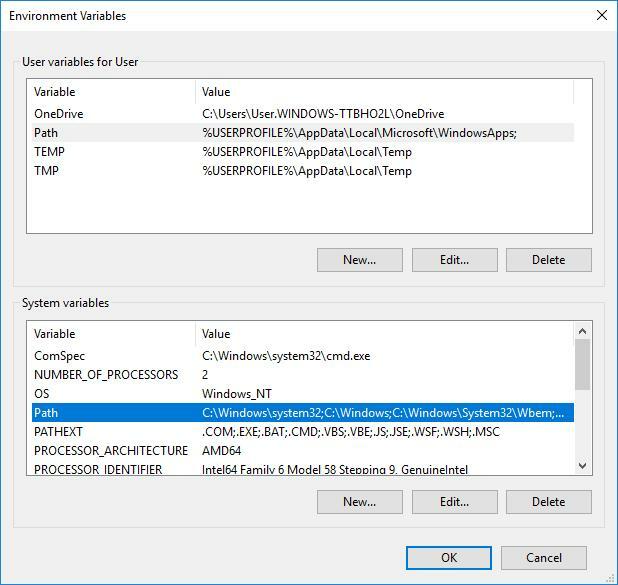 When I try to install the universal c runtime (kb2999226), It says "the update is not applicable to your computer". I'm using windows 7 Pro 64 bit. I am extremely impressed, and slightly surprised, that this worked flawlessly. Congratulations on the excellent post and many, many thanks for saving me from having to go back to wamp, xampp or (shudder) IIS. Hello. I have problem on step number 4. The files didin't show up, even if I re-install MySQL. Any help? I suppose you did not create the C:\Server\data\DB\data\ folder. See Step 2. Create necessary folders. Hello! Do you install PHP 7.2. * or another release? Hi! Why do we have to do step 15? It kinda confuses me a little bit. Hello! You are right it looks confusing as part of the installation process. I adjusted the article to be clearer. I hope the ‘Creating Apache Virtual Hosts on Windows’ guide will cope your issue. Thank you SO much for taking the time and effort to share your experience in setting this up. I really like the way you've set things up and your instructions have worked flawlessly for me . You saved me a LOT of time and helped me avoid a tonne of misspent effort. Thank you ! Excellent Guide but i would recommend a rewrite to adjust it so that the mysql root user is not empty password - this is a major security flaw and leaves the system vunerable and open to attacks. Hello! Thank you for the helpful recommendation. I agree with the importance of this issue. I will write additional article on security issues. Running web-server, we have to consider not only the password for MySQL, but also access control to the web-server, access control to the MySQL server (to prevent brute-force), the power of Apache to access the file system outside the web root folder and so on. It is very vast subject. It is important, but it is rather difficult for fresh users who just achieved the web-server running. Therefore, users concerned about security issues will continue to configure the web-server according to the next level article. Hi!, this is a great Tutorial TYVM! I see in the error.log file messages like this: PHP Warning: PHP Startup: Unable to load dynamic library 'curl' (tried: C:\\Server\\bin\\PHP\\ext\\curl………………………. And i see the file is called "php_curl.dll" in the C:\Server\bin\PHP\ext\. Should i change the namesin the php.ini file? THIS ERROR ALSO OCCURS WITH library 'intl', library 'ldap', library 'pdo_pgsql', 'pgsql'. PHP Warning:  PHP Startup: Unable to load dynamic library 'intl'…………. PHP Warning:  PHP Startup: Unable to load dynamic library 'ldap'…………. To fix every your issue you have to add PHP folder to System PATH in Windows, please refer to the step ‘12. 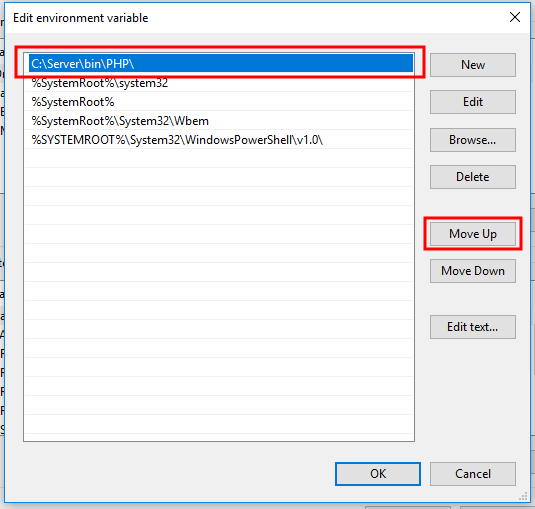 How to add PHP folder to System PATH in Windows’ of this manual. For those who can't get phpmyadmin page, you should restart your mysql and apache server. 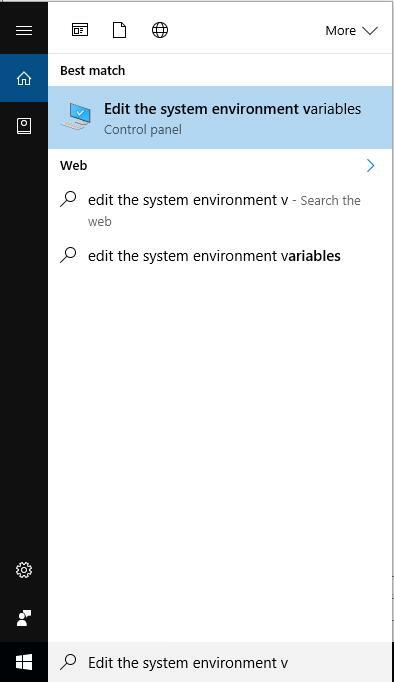 There is no such file in the noted directory. I keep getting the error: httpd.exe: Syntax error on line 537 of C:/Server/bin/Apache24/conf/httpd.conf: Cannot load C:/Server/bin/PHP/php7apache2_4.dll into server: The specified module could not be found. Did you download Debug Pack, Non Thread Safe or Sources? Download the proper version (VC15 x64 Thread Safe) to get the file. Thanks Alex, I solved that problem. However, I am now tryin to instal a website that generates and writes a config.ini.php to a data directory folder within the website - it is an automated process. Everything works until I get to about the fourth step - the writing of the config.ini.php file, then I get the error: Warning: parse_ini_file(data/config.ini.php): failed to open stream: No such file or directory in C:\Server\data\htdocs\webtrees\site-unavailable.php on line 47 . The problem seems to be a folder permissions problem that I have tried to fix without success. Essentially, I have given full control to the system on the data folder. Nothing that I have tried works and I hope you might be able to help with this issue. wonderful tutorials even for a beginner like me…….thanks!! I followed your instructions and everything works fine accept for phpmyadmin. I do not have "Users" or "User accounts" tab in my phpmyadmin. I have logged in as root as my username and leave it blank for password. It says I have no privilege to create database. How can this be solved? Unfortunately, I cannot reproduce the bug. Did you depart from the guide in any way? I followed the guide as you say and everything works fine. Apache, mysql, php and phpmyadmin can run smoothly. The only problem is on my phpmyadmin. I searched on google and it says users or users account feature might be removed for some security reasons…and now I don't know what to do to enable the privilege to create database. I never use php before. It seems your problem arises from the third-party advice to 'remove user account'. You can ask one more advice from the author of idea to remove – what should you do next. Purge everything from the C:\Server\data\DB\data\ folder. This is just my suggestion…maybe you could update and include this problem and how to overcome it in your guide so people can refer to it in the future. Can we do the same settings if we want to install MariaDB instead of Mysql !!? Yes, we can install MariaDB instead of MySQL. Tomorrow I will make some tests and write the instructions. I got a problem on step 7. And i have already did uncomment lines as shown on step 6 and restart Apache. But it's still the same. What should i do? did not replace ; extension_dir = "ext" with extension_dir = "C:\Server\bin\PHP\ext\"
did not add the PHPIniDir "C:/Server/bin/PHP" string in the c:\Server\bin\Apache24\conf\httpd.conf file or did it wrong. It is not complete list. However, there is the only one reason: you did something not exactly as in this manual. I had the same problem. Then I replaced backward slash with forward and restarted apache. It then worked! Subject: S.O.S. Phpmyadmin doesn´t run. Hi Alex. Thanks for sharing. 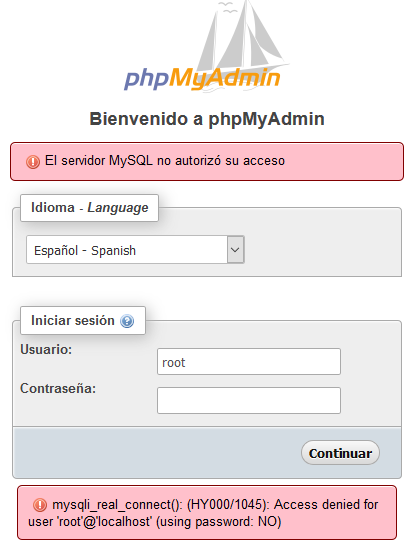 I can´t acces mariadb from phpmyadmin. 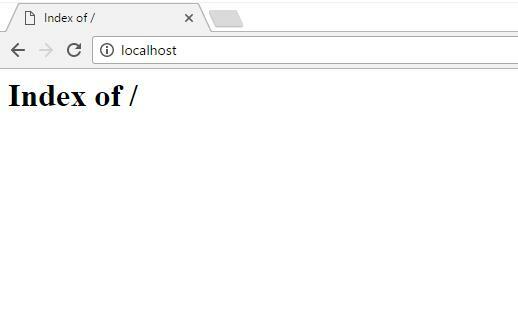 it shows me the next error: mysqli_real_connect(): (HY000/1045): Access denied for user 'root'@'localhost' (using password: NO). httpd-2.4.34-win64-VC15.zip, mariadb-10.2.16-winx64.zip, php-7.2.8-Win32-VC15-x64.zip and phpMyAdmin-4.8.2-all-languages.zip. Apache and MariaDB services OK. It looks like your MariaDB server is not running. Hello! What error occurred? Please provide more details for I have start point to help. Hello! I guess you missed Step 7. It seems like you did not create the config.inc.php configuration file with the above content. was checking on this issue myself because I got a blank page after having this file in the directory. After replacing lines of httpd.conf all When i paste command c:\Server\bin\Apache24\bin\httpd.exe -k install on cmd prompt(admin) it show that Service is already installed. Obvious question, did you already install Apache service? Do you have XAMPP or something like that? shows that you did not follow the guide exactly. So I don’t have no another advise for you but to reverse all made changes, start from beginning and follow the guide exactly. 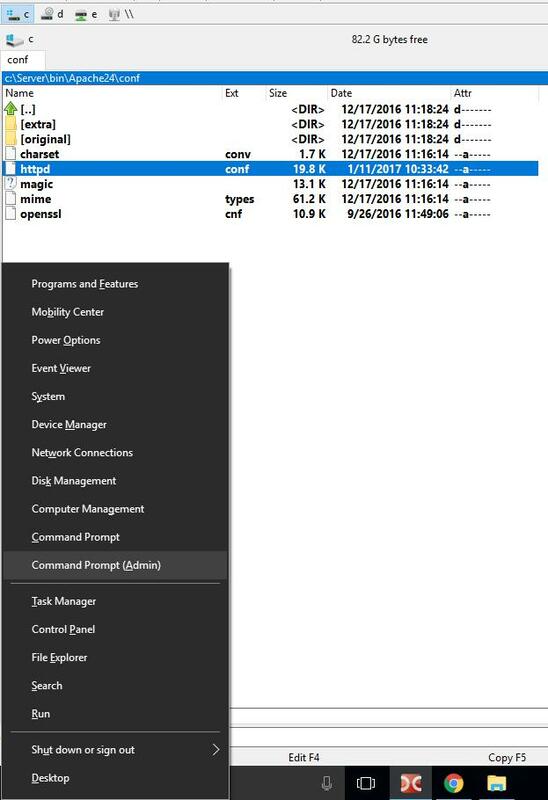 To reverse all made changes, see the ‘How to delete web-server Apache from Windows’ unit. Hello friend how do I access mysql and create a database from the windows console? Ok it works thanks genius!! Thanks. this was a great tutorial. After I have spent 3 days trying to get these 4 components to run and not able to get a tutorial like this. This is exactly what I wanted to do . Great job. Excellen guiding. I could configure everything without even hitch. It works wonderfully well. Thanks a lot. Big thannks to you sir. Can we add xdebug on server and how? Im having similar issues at step 4 as others, but the suggestions do not seem to help. Me too… so frustrating, everything else went smoothly. Can you help me? Tried all kind of changes. Still doesn't works. Hello! Did you follow this guide? What PHP version did you install? All works fine untill phpadmin. stuck on that. Couldn't pass on. Thank you, great tutorial. Clear, straight forward, easy to follow. Excellent work. I am sure that reset of your installation and following the instructions exactly will fix the issue. Probably you did not create the folder structure or missed one or more steps in Apache configuration process. Hello! 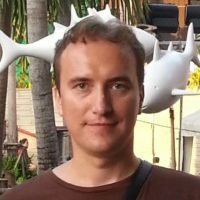 What messages in the C:\Server\data\DB\data\*.err file? 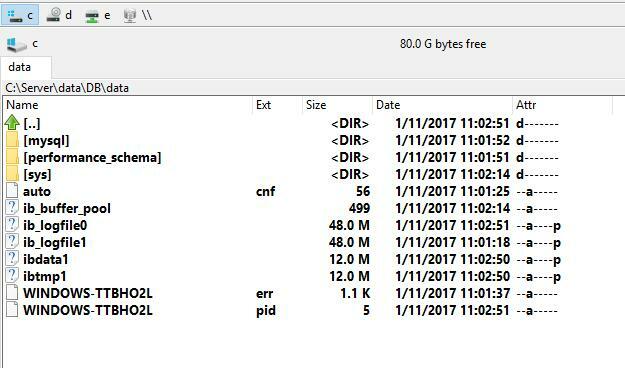 The file name can differ, it is located in the C:\Server\data\DB\data\ folder and has the .err file extension. .err file extension located in C:\Server\data\DB. There is no file in C:\Server\data\DB\data\ .I got this error msg. I can't use net start mysql. so i used .\net start mysql. The MySQL service could not be started.The service did not report an error. No files at all? It means you just did not follow this guide. That’s the reason of your problem. Hello Alex, I followed your guide to configure Apache and PHP on my Win10 Laptop. It worked perfectly till Apache config. After I add the i.php file, I do not get to see the php info. I get the error "ERR_CONNECTION_RESET". I have installed php and apache in C:/Server/Apache24 and C:/Server/php folders. My website directory is D:/Website. I have changed the paths in the httpd.conf file to match this. I restarted the server multiple times but no help. Can you help me troubleshoot the issue plz? Please come to the original page https://miloserdov.org/?p=55, and in your web browser press Ctrl+F and try to search the command you've written: it does not exist in my article. I guess you use Google Translator or another program to translate. It breaks commands in this guide. You can use Google Translator to read text, but you should copy commands from the original page. You writting skills are very excellent work @Alex. You have solved problem for many other people. Kudos to you. To download PHP for Windows, go to windows.php.net/download/. There select the file VC15 x64 Thread Safe or VC15 x86 Thread Safe. Note: you need to download the Zip file (and not the Debug Pack). Replace new_password with your actual password. Other than that everything worked flawlessly. Again, excellent tutorial! I know you might be busy with some other stuffs, but can you help me with the following problems i encountered…. firstly, I downloaded the latest version of all the required files (httpd-2.4.37-x64-vc11-r2, phpMyAdmin-4.8.5-all-languages, mysql-8.0.15-winx64 and php-7.3.0-Win32-VC15-x64. but i got these error…. the first is while trying to start sql. the second is while trying to login to phpmyadmin. I initially ignored the first error and went on to setup phpmyadmin; I only get to see the phpmyadmin login page. Hello! I don't see any errors on your screenshot. There are some warnings (not critical) and information messages. 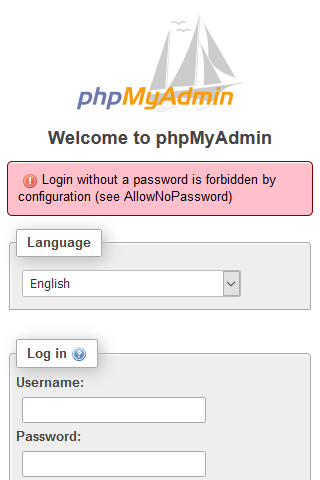 You can try to login in phpMyAdmin with ‘root’ as a user and with empty string as a password. By the way, where did you download Apache? 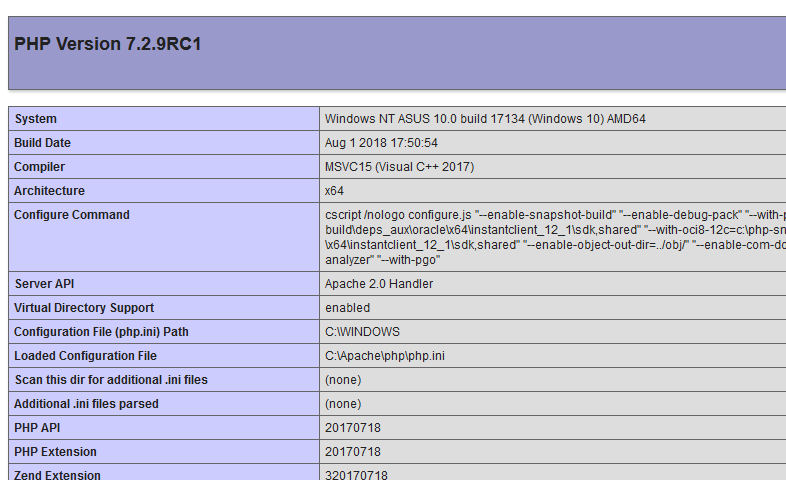 On https://www.apachelounge.com/download/ where I recommend to download binaries for Windows the actual version is Apache 2.4.38 Win64. And as a user of the web site at least the last 10 years, I’ve never seen release candidate (r2) versions there. My guide guarantee works only if follow it literally. Very usefull step-by-step guide! Works like a charm for me, thanks! Hold in mind that youu can constantly add elements later. 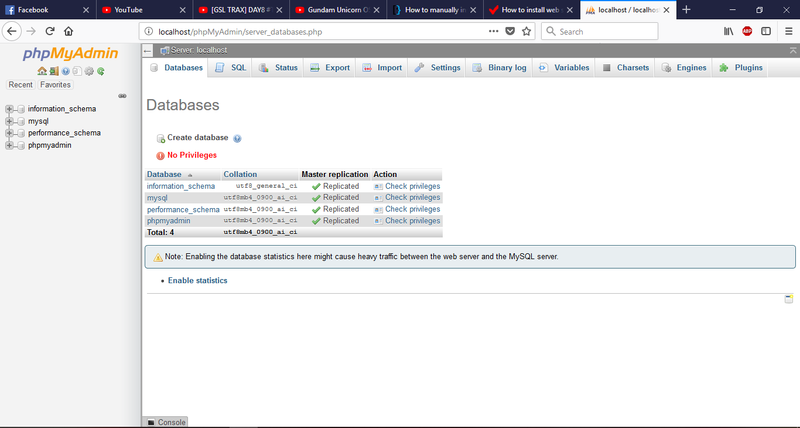 I used mysql 8.0.15 and phpMyAdmin 4.8.5. 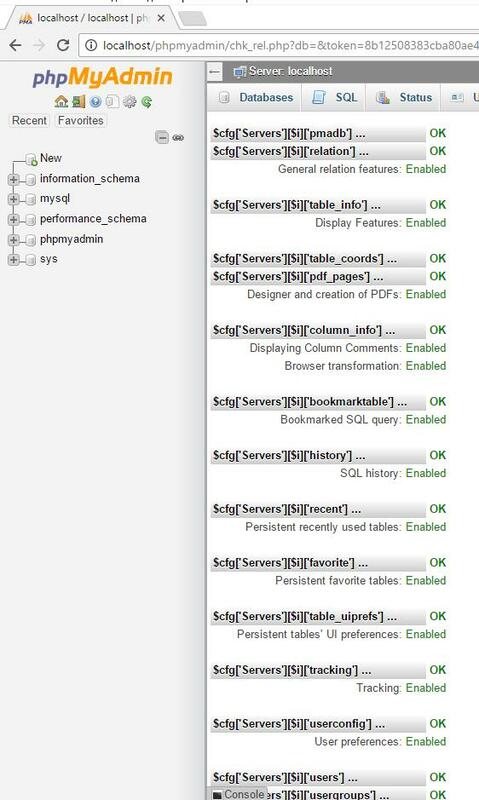 The data files that were created when sql was installed did not go to the "/Server/data/DB/data" folder. They went automatically to the "Server/bin/mysql-8.0/data" folder. DocumentRoot 'C:/Server/data/htdocs/' is not a directory, or is not readable". DocumentRoot 'C:/Server/data/htdocs/' is not a directory, or is not readable" means you did not create the C:/Server/data/htdocs/ folder. <DocumentRoot> was not closed means you have syntax error on the corresponding line. All in all, these problems only because you did not follow this guide literally. Start with a cup or a couple cups of coffee and redo the guide from the beginning. mysqld: [ERROR] Found option without preceding group in config file C:\Server\bin\mysql-8.0\my.ini at line 1. Please check your C:\Server\bin\mysql-8.0\my.ini file and compare your file with the file in this guide. Thank you so much, had a couple of problems, but when I re-did all steps for good measure it all worked perfectly. I saved me days of time. Great work. httpd.exe: Syntax error on line 539 of C: /Server/bin/Apache24/conf/httpd.conf: Can not load C: /Server/bin/PHP/php7apache2_4.dll into server: The specified module could not be found. The directory slashes don't match, 1 set is forward, 1 is backward. I don't know if it comes under this topic. 2019-04-11T11:09:26.617968Z 0 [Warning] [MY-010915] [Server] 'NO_ZERO_DATE', 'NO_ZERO_IN_DATE' and 'ERROR_FOR_DIVISION_BY_ZERO' sql modes should be used with strict mode. They will be merged with strict mode in a future release. 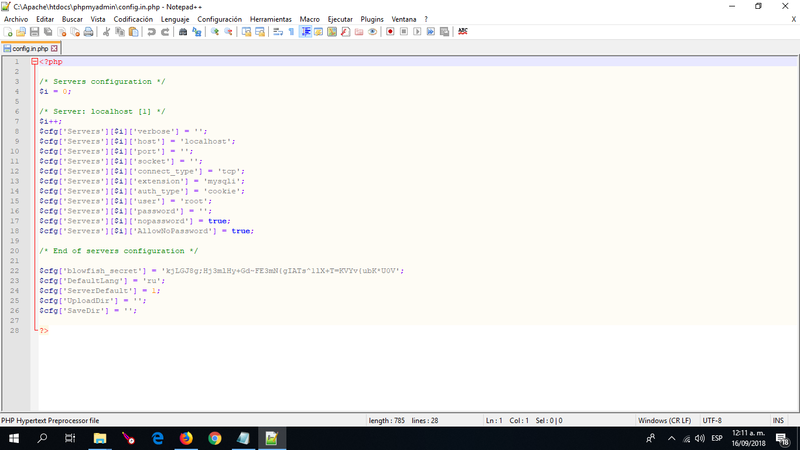 2019-04-11T11:09:26.620830Z 0 [ERROR] [MY-010457] [Server] --initialize specified but the data directory has files in it. Aborting. 2019-04-11T11:09:26.621148Z 0 [ERROR] [MY-013236] [Server] Newly created data directory c:\Server\data\DB\data\ is unusable. You can safely remove it. 2019-04-11T11:09:26.628549Z 0 [System] [MY-010910] [Server] C:\Server\bin\mysql-8.0\bin\mysqld: Shutdown complete (mysqld 8.0.15) MySQL Community Server - GPL.